Dermabond can be expensive and hard to find, so replacement products and substitutes have risen up to fill the gap. 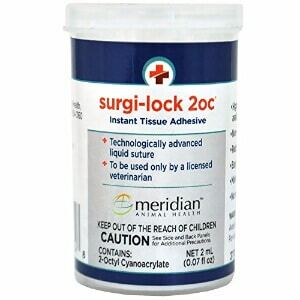 One of those replacements is Surgi-Lock 2oc, the veterinary equivalent of Dermabond. Chemically, both are exactly the same. The difference is in the packaging, ease-of-application, and price. For Inside First Aid's top pick in surgical glues see our article on Vetbond. Surgi-Lock 2oc and Dermabond both use 2-Octyl cyanoacrylate as the active ingredient, but inactive ingredients, like thickeners, may differ. Other considerations include FDA approval, packaging, and price. FDA approval is required for any medical devices used in hospitals, and that's a good thing. It provides a high standard of patient care and ensures that patients will only be treated with products that work. The flip side is the high expense of such rigorous testing, and those costs fall on the company selling their product. Veterinary products are still partly regulated by the FDA, but testing procedures are less rigorous. For home use, Surgi-Lock 2oc is a great substitute for Dermabond. As an FDA-approved product, Dermabond has put a lot of effort into the design of their applicator. The applicator is specifically designed to preserve the glue from curing and prevent contamination when using it on multiple patients. While this is important in a hospital setting with multiple patients, it also creates a lot of waste because each .7ml Dermabond applicator is single use. Surgi-Lock 2oc comes in a simple glass bottle that seals for reusablility. The applicators are disposable plastic pipettes. To reuse the pipettes, take a paper towel and wick the remaining glue out of the stem. Dermabond is no longer available to consumers without a verified medical account, but Surgi-Lock 2oc is significantly cheaper in comparison. Stop the bleeding by applying pressure to the cut. Use sterile gauze if possible or a clean cloth if not possible. Slightly uncover one edge of the cut and quickly apply Surgi-Lock skin glue. The blood may begin to flow again, but do your best to apply the glue. If the blood mixes with the glue and forms ugly lumps, it is normal. The important thing is that the bleeding stops. When the bleeding has stopped at the uncovered area, repeat this until the whole cut is sealed. Use skin closure strips or medical tape to keep tension off the glue if necessary. Do not apply triple antibiotic ointment or other petroleum based products as this will dissolve the glue. Surgi-Lock surgical glue creates an occlusive barrier that keeps out bacteria, protects the injury, and gives a moist healing environment for improved wound healing. No other treatment is necessary, but if the cut is bad, see a doctor or veterinarian. Surgi-Lock 2oc is chemically the same as Dermabond, but it comes in less convenient packaging. Dermabond is not available without a valid medical license anymore, so it may be hard to find. Surgi-Lock 2oc is a good alternative product. One annoyance with Surgi-Lock 2oc for first aid kits is that a separate pipette is needed to apply the glue. 2-octyl-cyanoacrylate (Surgi-Lock 2oc and Dermabond) does not have as long of a shelf-life as n-butyl-cyanoacrylate (Vetbond). This may be one reason that Dermabond is kept sealed in a shatterable glass enclosure.